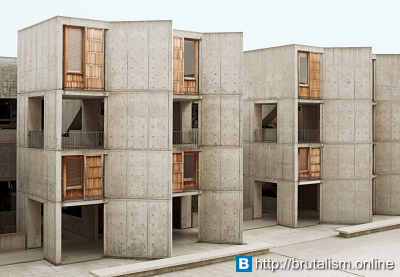 The Salk Institute for Biological Studies is an independent, non-profit, scientific research institute located in La Jolla, California. 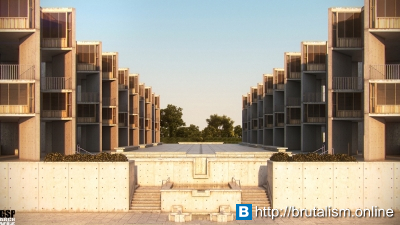 It was founded in by Jonas Salk (developer of the polio vaccine) and designed by Louis Kahn. 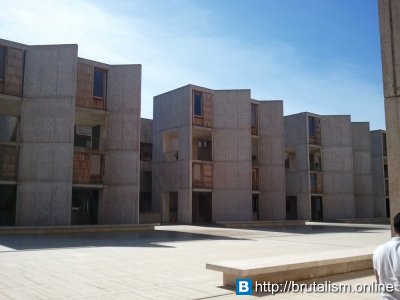 The institute is housed in a complex designed by the firm of Louis Kahn. 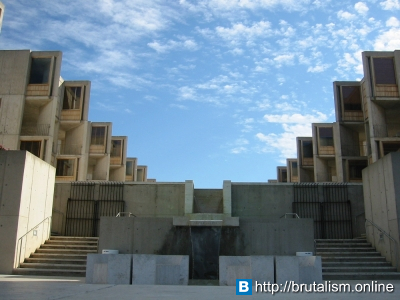 Jack MacAllister, FAIA, of the Kahn firm was the supervising architect and a major design influence on the structure that consists of two symmetric buildings with a stream of water flowing in the middle travertine-paved central plaza that separates the two. In the beginning the buildings were made up of different kinds of cement mixes as Kahn wanted to see what kind of mixture would best work as well as look the best - each mixture had a different colour. In the basement of the complex, there are different coloured cement walls because Kahn was experimenting with the mixtures. Kahn also added wood to the complex and wanted the wood and the cement to complement each other. The buildings themselves have been designed to promote collaboration, and thus there are no walls separating laboratories on any floor. There is one floor in the basement, and two above it on both sides. The lighting fixtures have been designed to easily slide along rails on the roof, in tune with the collaborative and open philosophy of the Salk Institute's science. At first Kahn wanted to put a garden in the middle of the two buildings. As construction continued, Kahn did not know what shape it should take. Kahn saw an exhibit of Luis Barragan's work at the Museum of Modern Art in New York and invited Baragan to collaborate on the court that separated the two buildings. Barragan told Kahn that he should "not add one leaf, nor plant, not one flower, nor dirt" - instead, make it a plaza with a single water feature. The resulting space is considered the most impressive element of the entire design. According to A. Perez, the concrete was made with volcanic ash relying on the basis of ancient Roman concrete making techniques, and as a result gives off a warm, pinkish glow. The basement also houses the transgenic core. Each laboratory block has five study towers, with each tower containing four offices, except for those near the entrance to the court, which only contain two. A diagonal wall allows each of the thirty-six scientists using the studies to have a view of the Pacific, and every study is fitted with a combination of operable sliding and fixed glass panels in teak wood frames. Originally the design also included living quarters and a conference building, but they were never actually built. Most of the laboratories and studies are named after the benefactors, such as the Sloan-Swartz Center for Theoretical Neurobiology and the Razavi Newman Center for Bioinformatics. A library that houses current periodicals, some books and computers is located on the 3rd level of the west end of the North building. The Frederic de Hoffmann auditorium and the Trustees' Room are located in the basement of the east buildings of the institute. 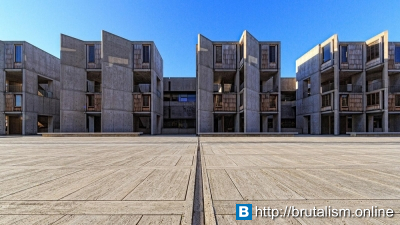 The Salk Institute’s open environment teeming with empty space is symbolic of an open environment for creation, the symmetry stands for scientific precision, and submerging crevasses allow warm, natural light to enter the buildings like the intellectual light that leads to discovery. The contrast between balance and dynamic space manifests a pluralistic invitation for scientific study in structures developed to accommodate their respective functions as parts of a research facility. Although modern in appearance, it is essentially an isolated compound for individual and collaborative study not unlike monasteries as sanctuaries for religious discovery - they are thought to have directly influenced Kahn in his design. 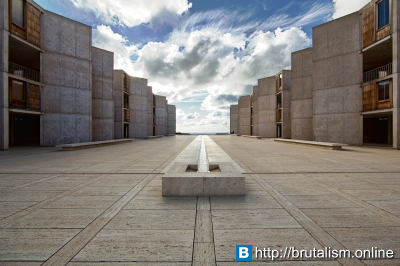 Ultimately, the Salk Institute’s meaning can be interpreted as transcending function and physical place as a reflection of Western Civilization’s pursuit of truth through science.